For me, some of the best days on the water involve more than just fishing. 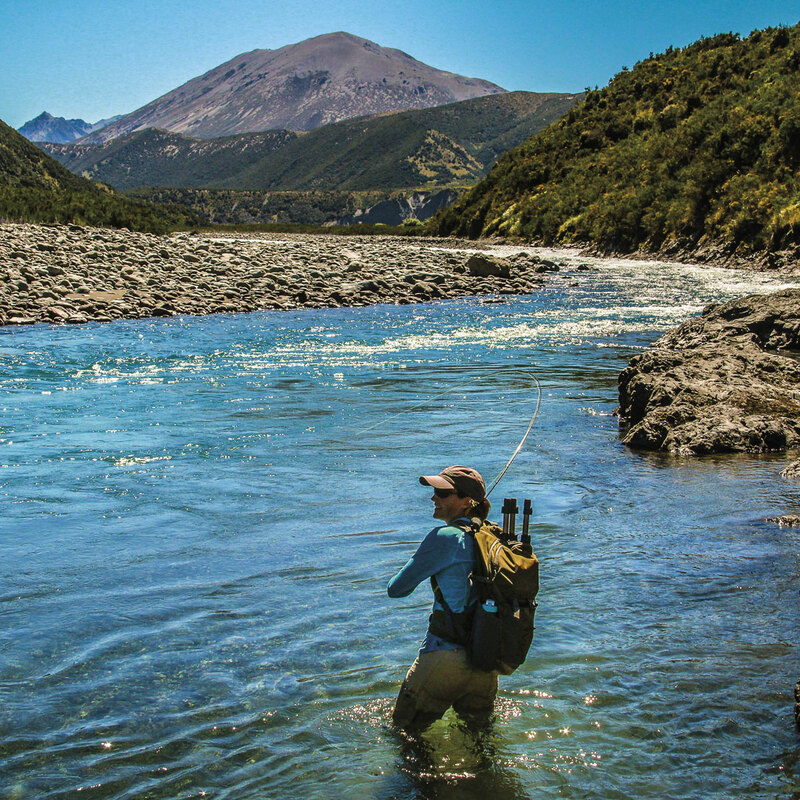 While we often endure seemingly endless streaks of harsh conditions while fishing, one’s appreciation of calm, blue-sky days can also become magnified. I’m reminded of a particular day, the last day of our annual trip to New Zealand. 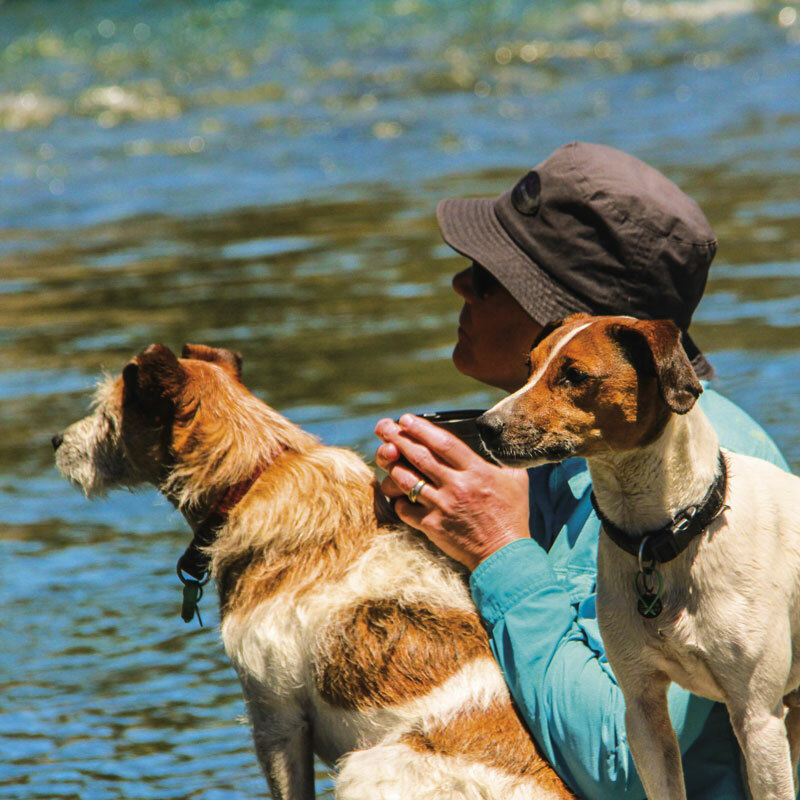 We’d planned a trip on the water with our friends Serge and Sharron and their pups. Outings with these friends always prove to be an adventure and I expected nothing less that day. Our hike to the river started out by scrambling down a steep cliff to reach the valley bottom. There were boulders the size of basketballs stacked like cordwood, loose enough to quickly roll your ankle. It wasn’t until the last third of the descent that we hit the classic boot-skiing type rock you hope for. We watched the cloud of dust fill the air as we each descended, making sure none of us bit the dust and went down head first. The day’s exploration took us to a river that has a steady gradient, one fast riffle after another. It was full of likely looking, classic edge water for browns and pocket water and pools for rainbows. It isn’t a river known to have many rainbows, but we’d explored a tributary of the river earlier in our trip and found them. We chose our route carefully with two Jack Russell Terriers leading the charge, (but not quite able to swim the heavier current on their own). After tramping downstream as far as possible, (without taking on a nasty bush bash), we stopped at the mother of all pools. It was a stunning, long glide of faster water with classic edges at the head. This lead into a drop in depth and a widening with a few nicely placed boulders: perfect holding water for a few trout. Our friend Serge started working the water on the near side, as it was obvious there were a few nice fish holding deeper in the crystal clear pool. He had a few takes on a nymph, but then decided there was one brown trout that he had to try for, holding in shallow water just upstream. Meanwhile, a few rises popped on the far seam line of the main pool, tempting us to cross and have a go. Dave, Sharron and I made our way across the river downstream of Serge and positioned ourselves on the high cliff side. Together, we sighted a few fish that were surfing the currents. I decided to use a long dry-dropper set up. Dave positioned himself higher up on the bank to spot for me, as he could see the fish’s movement in the gin-clear water. The fish were swaying to feed on subsurface emergers and only sporadically rising. I re-learned a couple valuable lessons that day. First, always trust my spotter! Second, when fishing a pool with multiple current speeds and current breaks, I have to ensure that my casts land far enough upstream, and in a consistent line of current to get a decent drift, but not so far as to line the fish feeding in the tail-out of the pool. 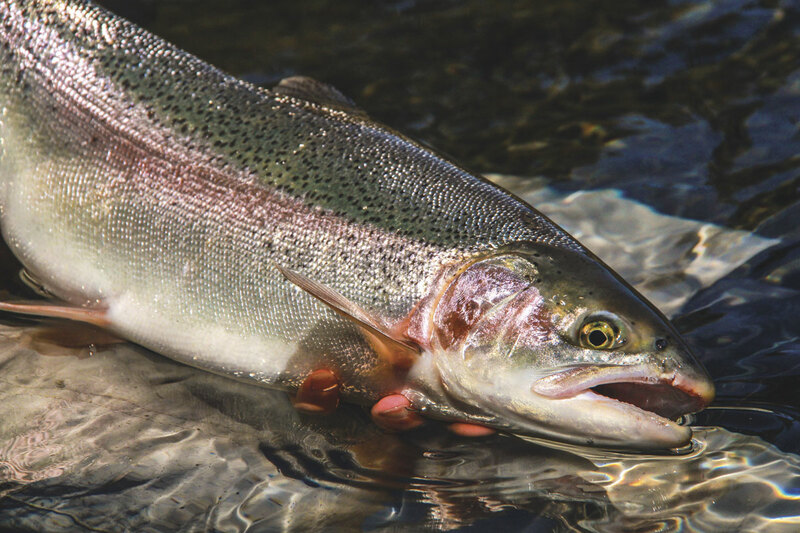 Also, when fishing rainbows in gin-clear water, the timing of the cast is paramount given their propensity to surf and weave in searching feeding cycles. While the water was gin-clear, I had glare and couldn’t see the fish most of the time. It was a huge advantage having Dave spotting from high on the bank, compared to where I was positioned at water level. He was able to see when it was best to cast to a fish that had come up in the water column and was in a good position to take my nymph. He was also able to communicate just how far to cast to not spook fish that had moved back into the tail-out to feed. Each cast involved an immediate mend or two to ensure the right drift. All the while, my good friend Sharron was taking it all in, ready to net whatever feisty rainbow I hooked up. The fact that we were all able to take part in the moment is what made the whole fishing experience such a fun, engaging time. We stayed at that pool for more than 3 hours as it kept producing fish willing to feed. The visuals were incredible. A few bigger fish came to hand that involved lengthy downstream fights, crossing one fast rapid after another, well downstream, to finally land the fish. It’s an adrenaline rush running after your buddy with your camera in hand, hoping your camera will stay dry and that you don’t trip and drown your electronics. It’s a special occurrence in New Zealand to find a pool with good numbers of feeding rainbows and browns that will continue to feed after you catch one after another in close proximity. Except for the average size of fish, it reminded Dave and me of our cutthroat waters back in Alberta. Eventually we were fished out at that spot and decided to have lunch. The hot afternoon sun had set in hard. Being so damn hot, we all decided we needed a swim. My friend Sharron loves to swim and volunteered to go first. Keep in mind that the river had some white water in spots, and my nerves kicked in before I finally got the guts to take the plunge with her. I quickly found out that it couldn’t have been more refreshing and fun! No funky currents pulled us under and no big Kiwi eels came to say hi. 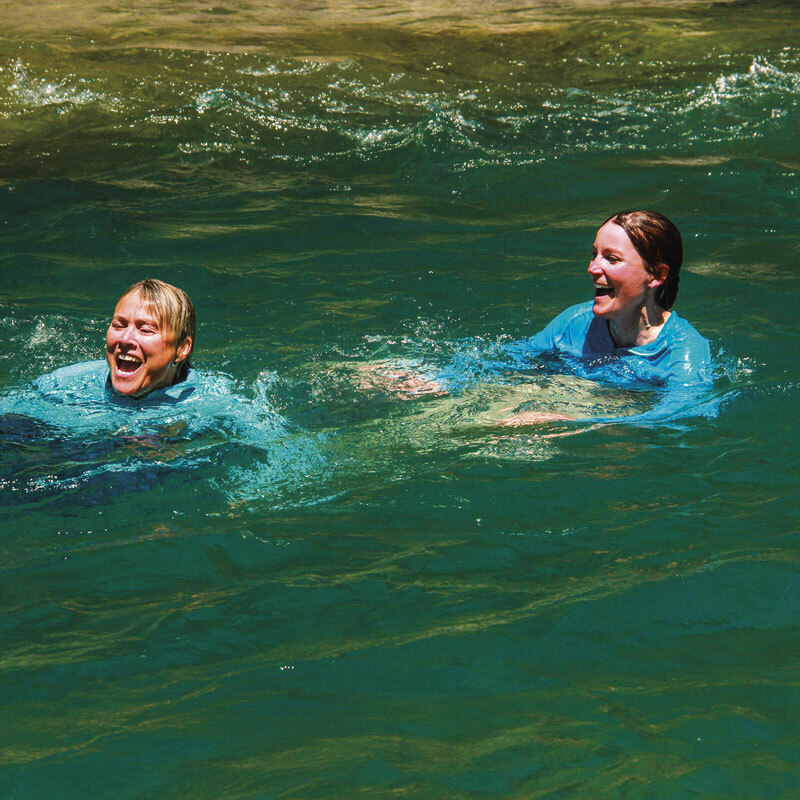 Cooling off, along with the steady push of the river flow had us all taking turns swimming the waves over and over again. We had found our own little amusement water park in the heart of the Canterbury high country. 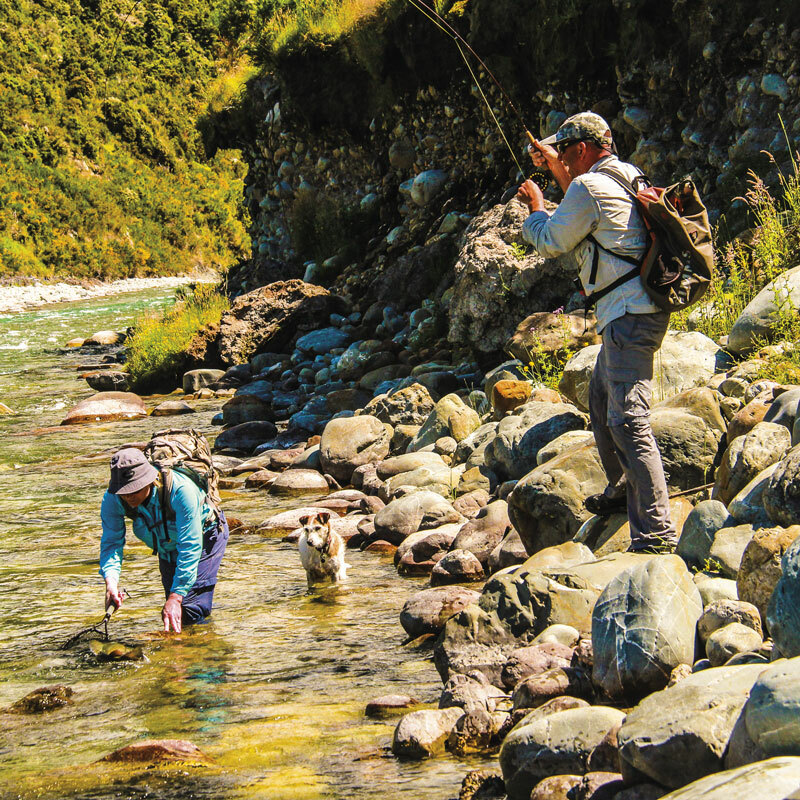 It was hard to leave that pool, but eventually we made our way upstream, fishing as we went. Who could have asked for anything more out of that day? Not me. Not only did we have the valley to ourselves, we were spent physically and were filled up with lasting memories shared with friends. It still stands out in my mind as one of the best days we’ve had in a decade of traveling to New Zealand. Adventure is at the core of who I am and I reflect on that day with the perfect contentment only a summer day brings.